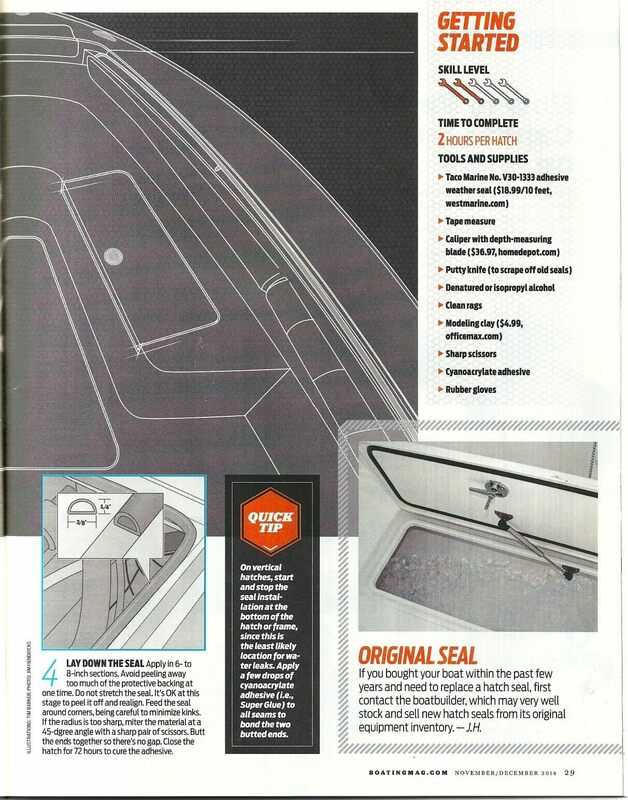 Trim-Lok, Inc. Rubber Seal featured in Boating Magazine’s Weekend Workbook! Buena Park, CA, November 11, 2014 – Trim-Lok, Inc. recently met with Jim Hendrix, writer of Boating magazine’s Weekend Workbook to discuss adding and replacing weather seals to boat hatches. 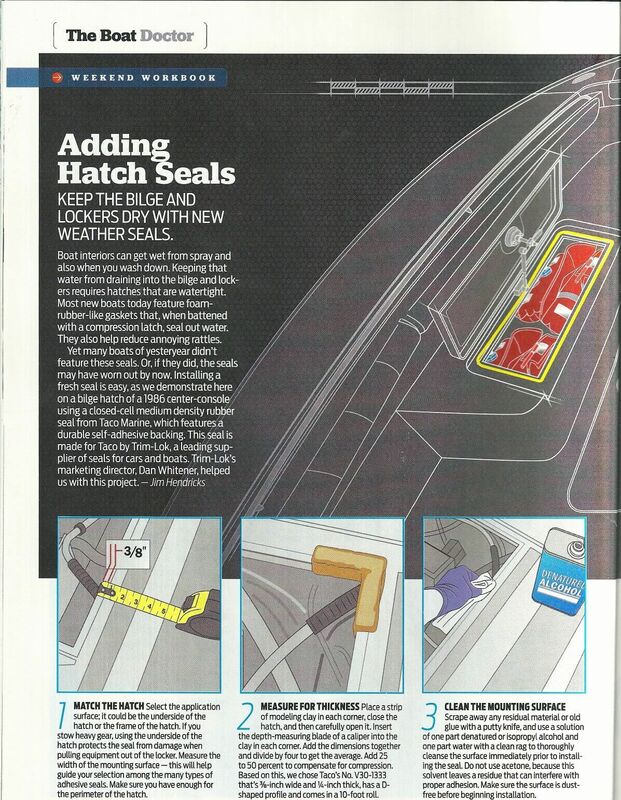 Installing the correct rubber seal on your boat hatch is essential to keep your bilge and lockers dry. Dan Whitener, Trim-Lok’s Marketing Director, worked with Jim to install a new rubber seal on a 1986 bilge hatch. The 4 easy steps outlined in the article show how to correctly select and measure for the right seal, how to properly clean the surface and finally how to install the seal. In this particular application, the rubber seal used is Trim-Lok part number X1153 with optional 3M pressure sensitive adhesive. Along with a few quick tips and a handy list of tools and supplies needed, Weekend Workbook does an excellent job of explaining this do-it-yourself weekend boat project. View the article or download it below. The November/December issue of Boating, the world's largest power-boat magazine, is available now. Visit Boating at www.boatingmag.com. Trim-Lok, Inc. is a well-recognized and respected manufacturer of high quality rubber and plastic extrusion trims and seals, and with over 40 years of experience Trim-Lok supplies parts into over 20 different industries! Trim-Lok, Inc. is an ISO/TS 16949 Quality Certified supplier, and continues to be at the forefront of developing new and innovative product solutions, such as their proprietary Flap Seal and Hatch Seal that no other company offers. Trim-Lok has made ordering even easier by re-designing their website which features a proprietary product builder ordering system. Customers will appreciate the ability to easily order products online without the hassle of calculating product codes and part numbers. Additionally, customers can utilize the site to request a FREE copy Trim-lok’s Catalog 650 and order FREE product samples to “try before you buy” to insure the part works in the application. Customers can also contact Trim-Lok, Inc. toll free at 888-TRIM-LOK (874-6565) or email at info@trimlok.com for more information or to request a Trim-Lok sales rep contact them for design/application assistance.